Paris, France – In an unprecedented series of events worldwide on April 30th, the United Nations Educational, Scientific and Cultural Organization (UNESCO) and the Thelonious Monk Institute of Jazz joined together to celebrate and recognize jazz as a vehicle for freedom of expression and dialogue between cultures. With events taking place in more than 190 countries around the world, International Jazz Day 2015 culminated with an All-Star Global Concert at UNESCO Headquarters in Paris that featured stellar performances by Annie Lennox, Herbie Hancock, Marcus Miller, Dee Dee Bridgewater, Wayne Shorter, Dianne Reeves, Al Jarreau, Femi Kuti, Hugh Masekela, Gregoire Maret, Claudio Roditi, Terri Lyne Carrington, Lee Ritenour, Ben Williams, John Beasley (Musical Director), and many others. The concert, which featured remarks from United Nations Secretary-General Ban Ki-moon, was a major highlight of UNESCO’s 70th anniversary celebration. 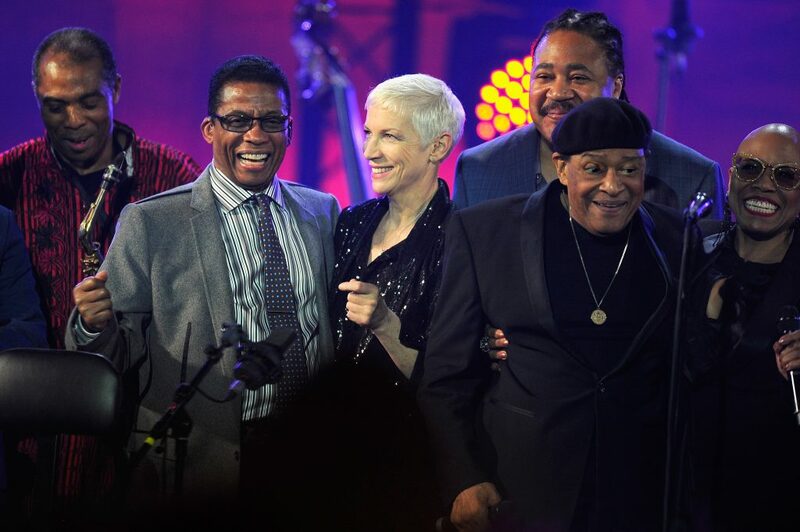 Celebrating International Jazz Day 2015 in Paris, France, are (left to right): Femi Kuti, Herbie Hancock, Annie Lennox, James Genus, Al Jarreau and Dee Dee Bridgewater. Photo credit by Kristine Sparow/Getty Images for Thelonious Monk Institute of Jazz. Held every year on April 30th, International Jazz Day was adopted by UNESCO Member States on the initiative of UNESCO Goodwill Ambassador Herbie Hancock, in order to highlight jazz and its diplomatic role of uniting people in all corners of the globe. International Jazz Day is recognized on the official calendars of UNESCO and the United Nations. International Jazz Day 2015 kicked off in Paris, this year’s Global Host City, with a daylong series of 55 jazz education and community outreach programs followed by 30 evening concerts. In addition to the events taking place in Paris, thousands of events were held worldwide on all seven continents. From Antarctica, Côte d’Ivoire and Romania to Afghanistan, Colombia and New Zealand, a staggering array of jazz-focused programs took place in clubs, restaurants, hotels, community centers, schools, libraries, performing arts venues and more. A complete list of registered events worldwide is available at www.jazzday.com. Following the global concert, a post concert reception for the artists was hosted by the Fondation Louis Vuitton where Herbie Hancock honored the guests with a special solo performance. Air transportation provided by United, the Official Airline of International Jazz Day 2015. For information about International Jazz Day, visit: www.unesco.org/days/jazzday and www.jazzday.com.